Remember I used to have a recipe called Mixed Vegetables – Cabbage, Carrots, Wood-Ear Fungus, Dried Lily Buds and Mushrooms? Well, I am going to modify that recipe a bit instead. Using most of the same ingredients, these will be steamed together with chicken to make a nice healthy dish. 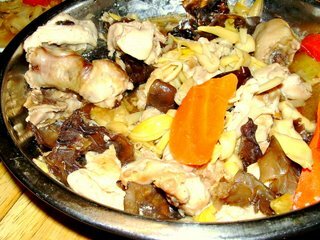 In this dish, the chicken is sweet-tasting and has a hint of chinese cooking wine as it was marinated prior to steaming. The meat will usually be tender when cooked as whole chicken leg (drumstick and thigh meat) is used and the wine further tenderises the meat. This is in contrast with the crispness of the wood-ear fungus, sweetness of the carrots and lily buds and smoky taste of the mushrooms. Truly, it comes with a riot of taste and goes well with steamed white rice. Actually, as emphasised in most of my recipes, you don’t actually have to follow the ingredients in full especially if you have difficulty finding them at the place you live. Just use a bit of creativity and substitute them with different ingredients. If you are not sure, feel free to ask me at the comment section below. This is my recipe for Steamed Chicken with Carrots, Wood-Ear Fungus, Dried Lilybuds and Mushrooms. Marinade the chicken for about an hour. Heat oil in wok, followed by garlic and chinese mushrooms. Fry till garlic begins to brown. Add carrots, wood-ear fungus and lily buds. Stir-fry for 2 minutes. Remove and set aside. Place chicken on a suitable plate for steaming (I use a stainless steel plate as seen in the picture above). Place the pre-stirfried vegetables on top of the chicken. Steam in wok / steamer for at least 20 minutes or until chicken is thoroughly cooked. I noticed that you have been using palm oil in your cooking. Can you tell me the benefits as opposed to other oils? I’m in my mid 20s and have just started to “like cooking”. Pls keep up the good work as your site sparked the interest in cooking, in my case! What are lily buds?? Do they carry certain flavours? Are they expensive?? How can i replace them? Jeeze : Hi! Lily buds are edible buds of the lily. It is commonly sold in dried form and is yellow in colour. Sometimes they are referred to as “tiger lily buds” or “golden needles” (gum jum). Being flower buds, they have a certain aroma associated with flowers but the dried version is less strong in aroma as compared to the fresh green coloured lily buds. They are quite cheap – or at least where I can get them here. I can’t really offer you a substitute because in this dish, they are pretty much an important ingredient. If you are unable to find them and interested to get some, do let me know. This is a wonderful site – I can study the Asian foods, try recipes, and view the questions/answers from others. My question: What are Chinese red dates and where can I buy them? Kathy : Hi! I am not sure where you are located. Over here in Malaysia, we get them quite easily. Perhaps you might want to check out the chinese stores near you.